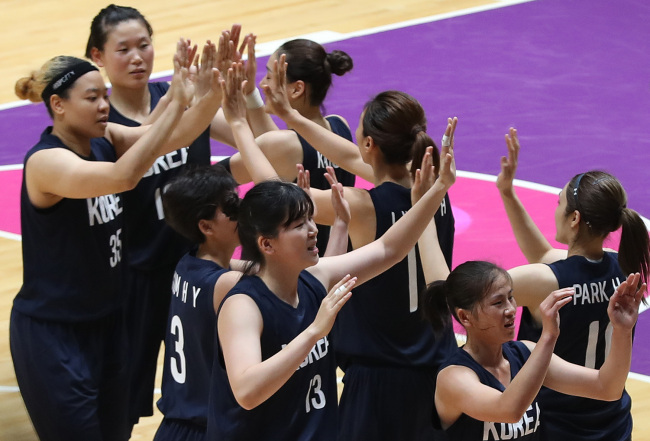 JAKARTA (AFP) -- A joint Korean women’s basketball team slammed Taiwan 89-66 to reach the Asian Games final on Thursday, helped by Las Vegas razzmatazz and some good, old, northern grit. Roared on by around 100 fans waving Korean unification flags, North Korean Ro Suk Yong joint top-scored with 17 points in a blow-out victory for the defending champions in Jakarta. The Koreans advance to face China in this weekend’s gold medal game after they outgunned Japan 86-74 in the second semi-final. Beanpole centre Park Ji-su chipped in with 10 points -- one of six Korean players in double figures -- in her first game since being released by WNBA team the Las Vegas Aces. A noisy section of Korean fans waving flags bearing the blue Korean unification flag with the slogan “One dream, one Corea”, and wearing matching T-shirts, serenaded the players throughout. As chants of “Uri nun hana da” (we are one) echoed around the arena, the Koreans were sparked by a captain‘s performance from Lim Yung-hui -- who at 38 is old enough to be the mother of some of her team-mates. Lim also scored 17 points, along with Park Hye-jin, in a one-sided encounter. “This is a once-in-a-lifetime opportunity,” Korea forward Kim Han-byul told AFP. “It’s definitely historical -- just the fact the North Korean girls are able to play with us,” added Kim, who was born Kimberly Roberson to a Korean mother and an American father in Indiana. “I‘m mixed myself and I came here with an open slate, that’s what our whole team did. We show each other photos of our families, they‘re really nice girls -- my mum’s met them! Kim looked every inch the street baller with her bleach-blonde hair and headband, while her northern cousins sported sensible, state-approved cropped cuts and no-nonsense ponytails. But the hard-working Ro, one of three Pyongyang-based players on the team, had travelling Korean media eating out of her hand after the game. ”When you are united good things happen,“ said the 25-year-old. ”I’ve never felt such warm support on a basketball court,“ added Ro, who paid tribute to Park‘s contribution. Park provided the highlight of the game with a gnarly spin move on the baseline, topped off with a finger-roll Allen Iverson would have been proud of. North and South Korea have also formed united teams in canoeing and rowing at the Asian Games in the latest sign of thawing relations on the troubled peninsula. The two countries marched together at the opening ceremony in Jakarta after forming their first-ever unified Olympic team -- a joint women‘s ice hockey side -- for February’s Winter Games in Pyeongchang. However, Taiwan coach Albert Wagner was less enthralled at Korea‘s modern-day version of the ping pong diplomacy that brought the United States and China closer in the seventies. ”Obviously it would be great if it were for the right reasons and not just to get good players,“ the American told AFP. China had too much firepower for Japan, American-based forward Shao Ting scoring 16 points in a comfortable victory. ”It’s been a hard road to get to the final,“ said Shao. "We will cherish this precious opportunity to take home a gold medal."